It isn’t the most beautiful looking dish in the world but it’s tasty! We have a bit of fusion going on today folks! 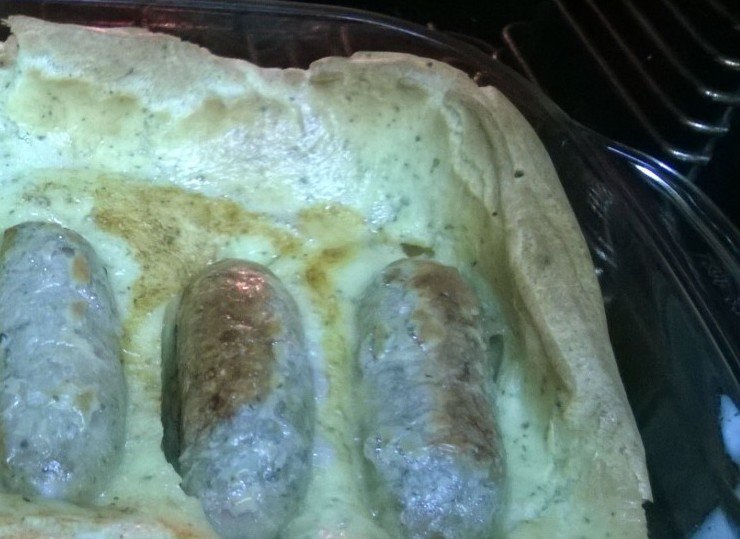 Toad in the hole is a traditional British dish consisting of sausages cooked in a sea of batter. I’ve taken that and Frenched it up a bit (ooh la la!) 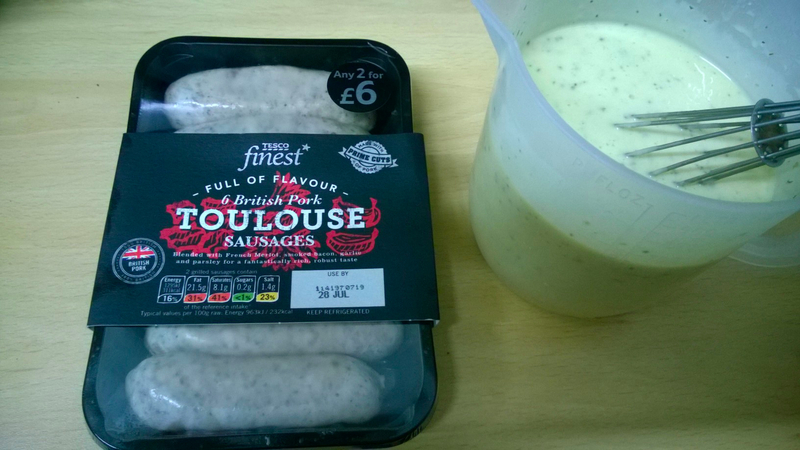 by using French sausages and herbs. It is more of a winter comfort food dish, but I made it in the summer, so we have seasonal fusion going on too (work with me here). (Yes I know it says “British pork” on the pack, but the pork is made into French Toulouse sausages, as I said, lots of fusion!). 1. Put the oil into a baking dish (mine is approx 9×12″). 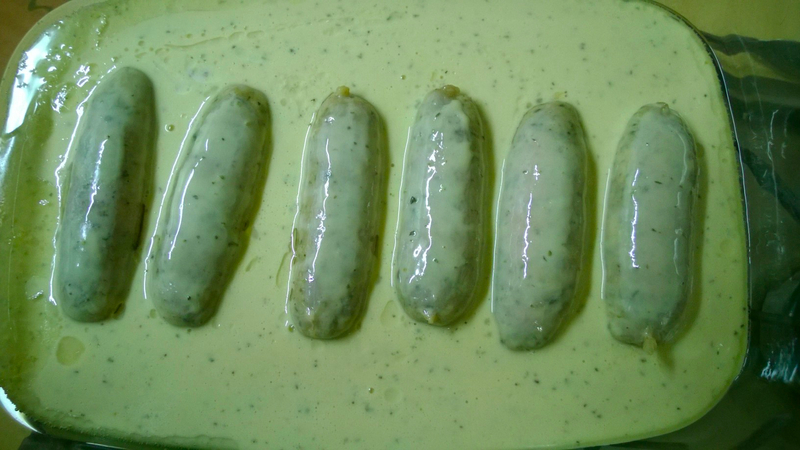 Place the sausages on the oil and bake in a preheated oven at 180C/350F for 10 mins. 2. While the sausages are cooking, whisk the flour and eggs together, adding the milk a little at a time until you have a smooth batter. Mix in the herbs and salt and pepper to taste. 3. 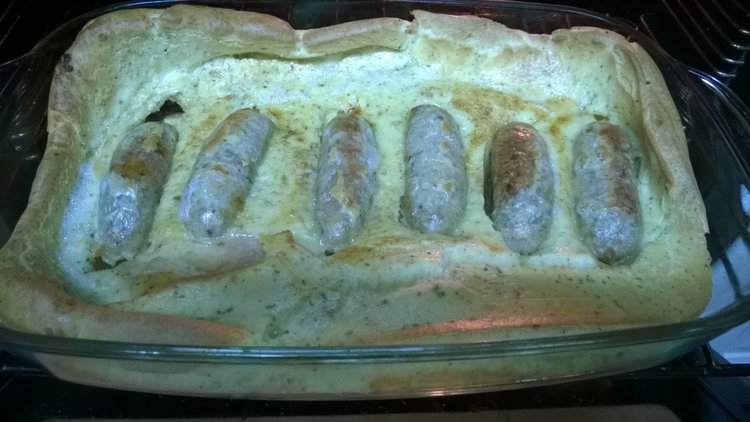 Remove the dish from the oven and pour the batter over the sausages. You don’t want to completely submerge the sausages. 4. Return to the oven for about 25-30 mins until it has risen and the edges are crispy and brown, the middle should still be fairly soft. Serve with onion gravy and vegetables of your choice. Oh for breakfast you’re thinking rather than dinner? Yes, I guess in the same way as you have sausage with pancakes for breakfast you could have this! Even though it’s a traditional British dish, it’s not actually that popular anymore, we generally prefer our sausages served with mashed potatoes, and we prefer our yorkshire puddings (which is what the toad in the hole batter is) with roasts. This is probably only about the third time I’ve ever made it. So, like a bigger pig-in-a-blanket? Well the batter is a yorkshire pudding batter, so a little different. Pigs in blankets are closer to sausage rolls over there aren’t they? Over here what we call pigs in blankets are actually little sausages wrapped in bacon that we traditionally have as an accompaniment to turkey at Christmas. Why do I get so hungry reading your blog?